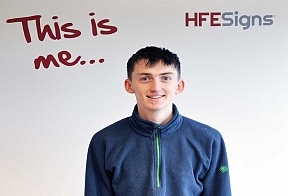 I’m a member of the production team at HFE Signs, I spend most of my time working in the rigid side of production, dealing with the signs after they’ve been printed. As the signs are printed on large sheets, my job covers everything past that, meaning I cut them to size and shape and add any additional extras which you might have purchased, this means flame polishing acrylic signs or adding rear rails to a dibond job. Along with Simon, we make sure all of the rigid orders are completed on time and to the highest quality possible. I joined HFE Signs from a job in hospitality. I spent 3 years as a junior football league referee and then got a part time job at a hotel, where I spent two years running the bar. I took Graphic Design at GCSE and A-Level and I’m currently studying a HNC in Graphic Design, spending Mondays and Tuesdays at University and Wednesday, Thursday and Friday here at HFE. I love to play golf in the summer at any opportunity I get, I also like watching the Formula 1 racing at weekends and sometimes take a trip up to Buxton to watch Stock Car and Banger racing. I also love watching a good movie or TV series, when I’m not doing any of the above I’m probably watching Netflix! Every year I play Shrovetide, a game played only in Ashbourne in the UK, people come from all over the world to spectate the game which was even played in the trenches during WW1!